Stuart Hughes the famous luxury designer comes with another new design which is called as Gold History Edition of iPad2. this Gold history edition of iPad2 by stuart hughes becames world's most expensive ipad2 ever which is worth for £5,000,000.00 of about $8 million!! !, It was made with gold, rarest gemstone on earth and a real dinosaur bone. This gold history edition iPad 2 was covered with 2 kg of 24k Gold on its back, and the front frame was made by the Ammolite which is more than 75 million years old, Ammolite stone itself was known as a rare and valuable opal-like organic gemstone, It is arguably the rarest gemstone on earth, There's another luxury stuff added into this Gold History Edition of iPad2 which is a a single cut 8.5ct flawless diamond inlaid in its own platinum surrounded by 12 outer flawless diamonds on the home button, and for the Apple logo backwards on this iPad he uses a grand total of 53 individually set diamonds. not only that stuart hughes also add 57 grams of 65 million years old T-Rex thigh bone into this gadget. sections of a 65 million year old T-REX Dinosaur's thigh bone was splintered and then shaved into the Ammolite , then finished off with ultimate jewel , as single cut 8.5ct flawless diamond inlaid in its own platinum surround with 12 outer flawless diamonds. Here's the summary of the material of this Gold History Edition iPad 2 by Stuart Hughes. 16K Diamonds, 8,5K Single diamonds, 2kg of 24k Gold and 57Grams of 65Million Years old T-rex bone and 75 Million years old Ammolite the rarest gemstone on earth. That's reasonable if the price of this Gold History Edition iPad2 was really expensive. this designs was far more expensive than this Gold Plated iPad2. There's only 2 unit Gold History edition of iPad 2 by stuart hughes in the world's today. 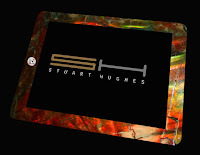 I Wonder who will bought this ultra luxurious iPad2 by stuart hughes.